I’ve opted to not write about RPG products except via actual play for a while now. I want to make an exception because I want to tell readers who have never played, or run an RPG that they should look into this game, the Yellow King Role-Playing Game (henceforth YKRPG) from Pelgrane Press. Dungeons & Dragons (D&D), and role-playing games in general, have experienced a resurgence with things like Stranger Things , and Twitch streamed games like Critical Role introducing the hobby to a wider audience. As a result there are a lot of people around who are interested in RPGs but have never played, want to, but need a place to start. I think this is a great candidate. All you will need to play is the game books (either in print or PDF), a single six sided dice per player, and a group of friends. The rules—comprehensive without being complicated—are crisply defined, and clearly described. Not just the what but the why. It’s set approximately in the real world: there’s little friction to diving in; no almanac of world details to learn first. Combat rules are de-emphasised, but when fighting does break out, there’s a lot of story-based nuance: it’s not just a series of fights to the death. A caveat: this review is based on the draft version of the text made available to Kickstarter backers over a year ago. I don’t expect things to have changed drastically; the changes should largely be refinement and additional information. I’ll explore these points in more detail below, but first a quick overview of the settings and genre of the game. The YKRPG is a horror game based on four short stories by Robert W Chambers written in the 1890s. In the likely event you haven’t heard of, or read these don’t let that put you off; the stories are short and intentionally unclear about the details of the titular king and the related Mythos. The game books cover everything you need to know1. Some elements may be familiar if you have seen season one of HBO’s True Detective . If you don’t typically like horror, don’t let you put that off either. The way horror is presented in role-playing games is different to how it is presented in movies, or novels (themselves quite different). Further, the horror of this game is of the “weird fiction” variety most notably found in pulp magazines of the early 1900s, mixed with classic gothic ghost stories. As a group, you can set the boundaries around what you are willing to accept, e.g. you might decide to omit descriptions of gore, or perhaps body horror is something you can’t handle (I can’t), so you just won’t have that appear at the table. Further, the game has two modes of play, Horror, and Occult Adventure, so there’s a lot room to tune things to your group’s tastes. Rather than one setting, the game is split across four: two historical (Belle Epoque Paris [1890s], and an alternate reality 1947 of war-torn Europe), and two contemporary (the aftermath of that war in 2017 America, and a subtly weird version of our world). The game outlines a grand campaign that runs through all four settings over an extended period of play, as well as options for playing short games set in only one of those. Each setting is contained in its own book, with the Paris book also including the core rules of the game. In all those settings, the titular King in Yellow is trying to corrupt and possibly conquerer Earth, and the player characters are attempting to thwart him. When played in long running game across two or more of the settings, the characters are connected in some way to the characters that the players played in the previous settings. The exact goals of the King in Yellow are up to the Game Moderator (GM; the player who takes the role of running the game), and the books provide options and guidance about where you might wish to take it. A typical RPG provides a lot of rules for how to do various things in the game. Exactly how many and how complex those rules are varies greatly: some games prefer a more lightweight approach and provide only rules for the core activity of the game, while others provide rules systems to handle any situation, and with a great deal of granularity, and of course games fall all across this spectrum. The YKRPG falls at the lighter end of the spectrum, but with a simple core that can be extrapolated to most scenarios. For fans of Pelgrane Press’s prior Gumshoe games – Gumshoe is the name of the rules that YKRPG uses – this is the most streamlined variant of the system to date. This is good in its own right for new players: less rules is less rules to learn, and a shorter on ramp to just starting playing. One area that new players may not appreciate how streamlined the rules are is character creation. The number of purely mechanical choices that players need to make in creating a character have been stripped to the minimum, while the qualitative story facets are highlighted. Where this game really shines is the commentary material that explains why the various rules exist, and how to deploy them. It’s rare to see this quality of insight into the design of a game, let alone this quantity. A secondary feature of the rules, is the guidance for the GM on how to create and run a series of YKRPG scenarios. Pelgrane has always done well here, and this is no exception. This section is gold for getting a game going. If you’ve read or played a Gumshoe game before it’s worth noting that the presentation of the clue finding rules here are the best explanation of those procedures so far. This seems like its not a big deal, so why is it second on my list? Simple: role-playing games take place on a shared imagined stage. The closer each players version of that imagined stage, the less friction there is at the table. The more settings needed to be learnt prior to sitting down at the first session, the harder it is to get a game together. Don’t worry though, the game provides a comprehensive gazetteer of game-able information for each setting. But you can always turn to Wikipedia (which is never wrong) or other reference texts to draw from. The YKRPG does a doubly good job here. 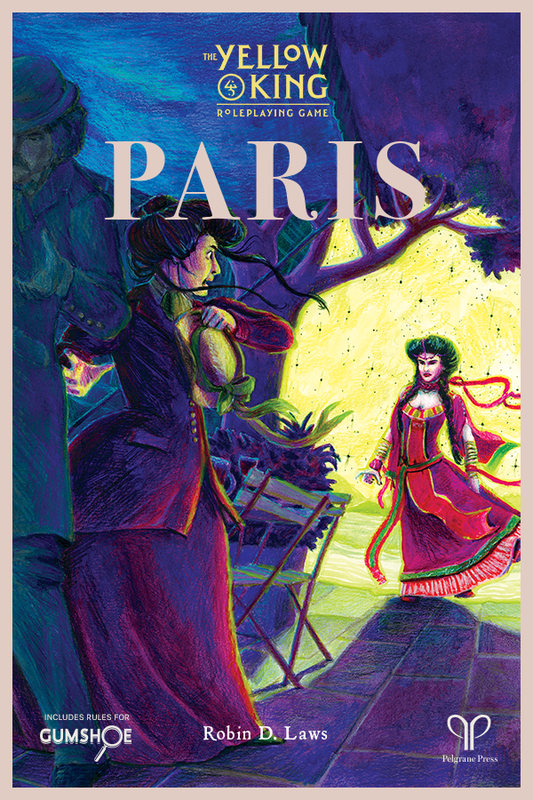 In the first setting, Belle Epoque Paris (1895), the players take on the role of art students from America (or another country familiar to your group if you prefer) living in Paris. The players, nor their characters, are expected to not know Paris well. Additionally, due to the reality distorting weirdness of the setting, it’s only approximately Paris (for example). You have leeway to make stuff up or just be plain wrong with no pressure. In other words you get the advantages of a fantasy setting without the disadvantages. The role-playing hobby evolved out of tabletop wargaming, but the war game has largely not evolved out of role-playing games. You can see this in the complex combat systems present in many games, and basically all popular games. These systems are not only large, but emphasis a turn by turn bloodletting that is at odds with some genres. This isn’t to disparage those games, but just that it doesn’t need to be the extent of how physical conflict is represented in a game. While it’s true that the YKRPG includes a combat subsystem, it’s radically different to say D&D. For starters each player rolls a single six sided die for the whole combat. For another, the players lay out their objective before rolling. Do they want to kill or subdue their opponents? Do they just want to run past, escape, or block them? Something else? This objective mechanic is not typically a reified concept, but its presence leads to a more nuanced, genre appropriate fight system. Yes, even though the second setting is the the weird European wars, it still doesn't have a war game hidden inside it. The second facet of the system is the way mental and physical damage is tracked. The traditional model is quantitative: each character has some kind of numeric meter for their healthy, such as hit points; this meter counts down toward zero over the course of a fight. They may have a second meter for mental health such as sanity in Call of Cthulhu , or stability in most Gumshoe games. Instead, the YKRPG uses cards to track injury and shock. Each player may hold up to three (or four in Occult Adventure mode) of each card in their hand; gaining one more removes the character from play (e.g. they died, became too injured to continue, or could no longer sustain the mental stresses of investigating the Carcosan mysteries). These cards list any additional modifiers they incur, and the means for removing them. This means that injury and shock from different sources impacts your characters in different ways. In contrast all damage in a meter based system is essentially the same. You may find this brush with death invigorating. Or not. On your next test, roll a die and discard this card. Even result: +1 on test. Odd: -2 on test. -2 to Physical tests. Counts as 2 Injury cards. Trade for the card “On the Mend” as recipient of Difficulty 6 First Aid test. If still in hand at end of adventure, you succumb to your injuries and die. While there is a lot of rule-specific jargon on these cards, I think you should still be able to get some idea of the sorts of things that are possible. It’s this combination of fast resolution, explicit objectives, and card based injury that come together to produce a light weight but nuanced and story driven fight system. I should point out here that Pelgrane Press, and early players of the game, have not yet settled on the best way to handle the cards themselves. You don’t get a physical set as part of the game, so you might find yourself printing them out from the PDF, or getting the players to write them down. Robin D. Law’s – the games creator – has been investigated a number of ways of handling them electronically using off the shelf collaboration tools, and this seems to have some merit. I suspect that someone (maybe me?) will end up writing a custom tool to support the specific uses cases of the game. Why not the Yellow King? Having spilled all these words about why you should consider this game, here’s a few on why it may not be the game for you. You really want a fantasy game with elves and orcs, dragons, fighters and wizards etc. You want the more crunchy turn by turn combat. Horror is a hard pass regardless. If these apply, the good news is you are well catered for in the tabletop role-playing space. Dungeons & Dragons is a fine choice. If you are looking for a family friendly game, I would probably recommend the excellent Mouse Guard RPG instead as the YKRPG does contain adult themes. Mouse Guard is an excellent game, and has similar strengths. You may want to have a catalog of published scenarios and campaigns to draw from. At the time of writing the YKRPG has four: one in each setting book, and with no other material announced. Pelgrane have a track record of producing high quality scenarios for all their Gumshoe games, so it may just be a matter of time. Otherwise D&D has 50 years of material to pull from, and Pelgrane’s Trail of Cthulhu has a catalog filled to the brim with excellent scenarios. Lastly, mind share: if you want ready access to a large pool of existing players then you should look elsewhere. D&D is the biggest game around. On the other hand you could get your friends to try the Yellow King, there’s not a lot to have to learn after all. I think it should be pretty clear by now that I am really impressed with this game. It is tightly focused, with streamlined rules. It has four evocative settings that you can use independently, or in a grand campaign. New players, and experience hands alike should find a lot to enjoy in this game. The game is currently available in preorder direct from Pelgrane Press with access to the draft PDFs, with the final PDFs and physically copies available soon. Robin D Laws’ summaries of what happened in his home game for Paris , The Wars , Aftermaths , and This Is Normal Now (this last one does contain minor spoilers for the suggested campaign structure). A video of one session game with Robin D. Laws running a preview of YKRPG. Laws takes a group of players through character creation and a single episode of the game that introduces the characters to the setting, and spins out a scenario around their characters. Note that this video predates even the Kickstarter preview draft by some time, and as a result isn't representative of all the mechanics of the game. QuickShock 101 – Laws introduces the core ideas of this version of Gumshoe. If you are interested in reading the four Chambers’ The King in Yellow stories, they are in the public domain if you do want to read them. The four stories you are looking for in that book are The Repairer of Reputations , The Mask , In The Court of the Dragon , The Yellow Sign . It’s worth noting that these stories were written in the 1890s some (notably The Repairer of Reputations ) are set in the 1920s.